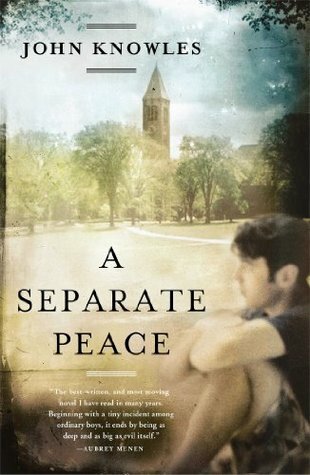 I recently reread A Separate Peace and I’m still not sure where I stand on the novel as a whole. I think it’s complex and has a lot of layers despite its simple story of two friends, Finny and Gene, and their school Devon. This novel starts out as a reflection by an adult Gene, who has returned to Devon to visit, and possibly just to relive his time there, but as we get deeper into the story, we see that the relationship between Finny and Gene gets complex. Finny is the athletic guy that seems to be able to do anything, is fearless, and outgoing to a fault. He drags the more passive Gene along his adventures that range from bicycling hours to the beach, skipping class, creating fictitious sports, and jumping out of a tree and into the river as a rite of passage into a club created by Finny. Gene is more academic while Finny is more athletic but even their personalities, one being an introvert and the other an extrovert are a point of conflict for Gene. For me, it seems he admires Finny for being what he could never be and hates him all the same. This is a complex relationship to say the least, but Gene allows himself to be pulled out of his comfort-zone by Finny and then regrets it to the point of being angry at his friend. In cases where we see Finny as simply a free-spirit type that prioritizes fun and daring above studies, we also see Gene’s admiration and annoyance at his friend. In one scene, Gene even yells at Finny that he (Gene) needs to study and Finny seemes ernest in his surprise, admitting that he thought Gene just did well because that’s who he is. Finny even goes so far as to deny obvious facts about his fall from the tree and, as we see later, Gene is even in denial or disbelief at his own actions. I like this book but it’s strange because Gene is kind of a sociopath that has moments of repentance and Finny is forgiving to a fault because they seem to be far too different to be friends despite liking each other. Again, this is a complicated classic that has complex characters and motives but I’d suggest it as a read because, again, it’s not a terribly happy tale but one that really explores differences, relationships, consequences, denial, and growing up.